Every sports memorabilia collector eventually prunes his stash (I did it once, in 1985, and I still have misgivings). But rarely does one of us consign a singular item to an auction house, let the process go along so far that the piece gets photographed and included in the auction catalogue – and then have the misgivings and withdraw the item. Such a collector is Orel Hershiser. 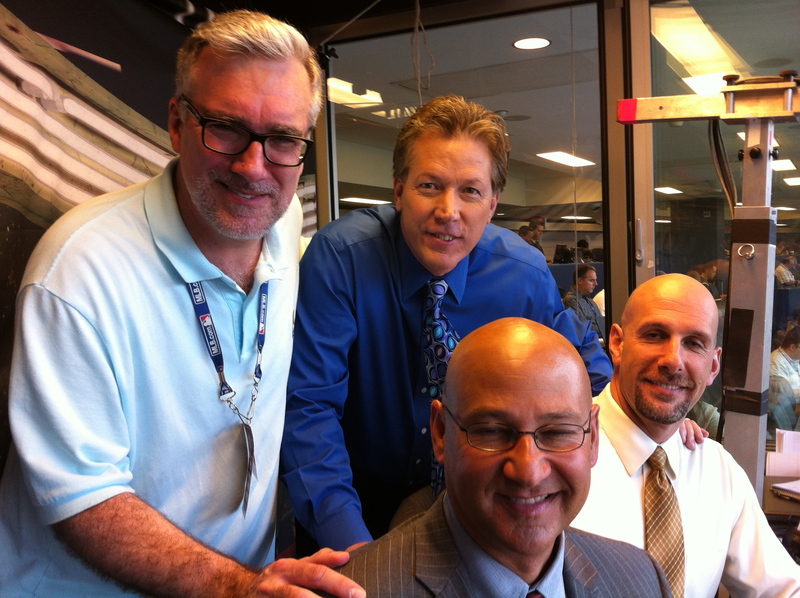 The 1988 Cy Young Winner, still the owner of baseball’s streak for consecutive scoreless innings pitched, now part of the instant classic that is the ESPN Sunday Night Baseball trio with Dan Shulman and Terry Francona, has been for nearly all of his 53 years another one of us – the accumulators and protectors and pack-rats of the cherished relics of the game. I’ve been swapping cards with him since about 1987. But Bulldog is more than just a card and autograph collector. Unlike nearly every other one of us, he also has a real baseball career beyond the onlooker status of his colleagues. 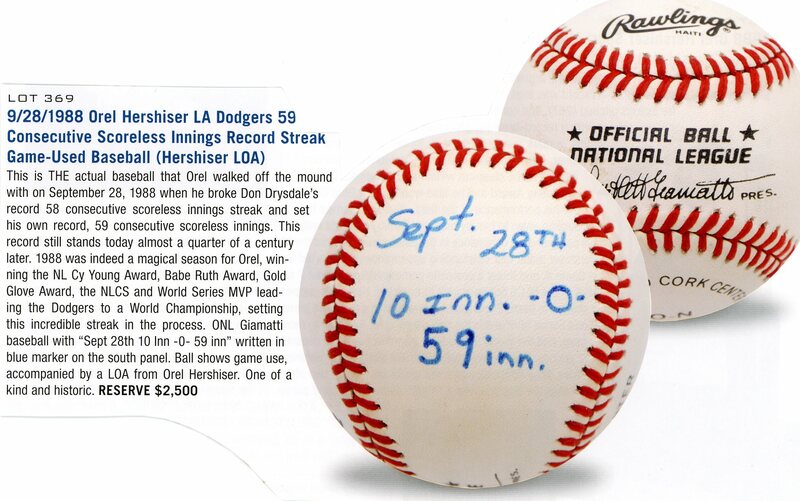 Hershiser has kept countless terrific, even unique, items from his playing days, and had just reached that “pruning” moment. In an upcoming Grey Flannel Auctions sale, he is selling several dozen uniforms, jackets, gloves, trophies, baseballs, and even card sets (’70s O-Pee-Chee Hockey – I mean, this is a collector). But it turns out he is not selling the baseball with which he established that consecutive scoreless innings streak in 1988: As you see, the scoreless streak ball is in the Grey Flannels Auction catalogue. But you can’t put in a bid, for $2500 or any other amount. At the company’s website, Lot 369 is nowhere to be found. The auction house explained to me today that Orel just couldn’t bear to part with it. That would be a natural emotion for any of us collectors, so one can only imagine the emotional tug when it’s the baseball you threw to set the record which happens to be yours. I mean, I own the ball that pinch-hitter Cookie Lavagetto bazooka’d off the right field fence at Ebbets Field with two outs in the ninth inning when Bill Bevens of the Yankees was an out away from the first World Series no-hitter, in Game 4 of the ’47 classic, but that doesn’t make me Lavagetto, Bevens, or even a witness. I just own a neat baseball. Imagine having pitched the neat baseball (or hit it). As mentioned, Hershiser is auctioning off a lot of such neatness, including his SPORT Magazine 1988 World Series MVP Trophy and other items from his other days with the Mets, Giants, and Indians. But the scoreless streak ball? That, he’s keeping.